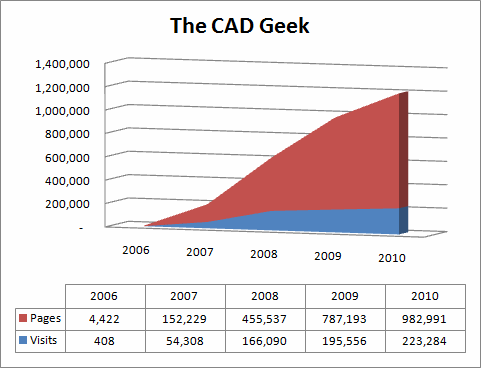 I’m excited to announce that this month The CAD Geek Blog reached a milestone – its 5th anniversary! The fifth anniversary date was actually January 17, 2011 (last Monday), but like these past five years, the date flew by rather quickly as I continue to author the update to my current book AutoCAD 2011: No Experience Required. As I’ve shared on several occasions, The CAD Geek was actually started out of frustration. Over the years coworkers, local user group members, and several others not too unlike yourself had shared countless tips & tricks with me, yet I found myself using only a small percentage of them as I had no way of truly organizing them. Sure I had a “CAD Notebook” which was a mess of post-it notes, printed web pages, a couple Lynn Allen Tips & Tricks booklets, and the holy grail of said notebooks – food stained pages of notes from those lunch & learn sessions. Looking for a way to bring some organization to this mess, I decided to start a webpage to digitally archive all these great tips. I’m still humbled by the many opportunities this blog has provided me over the past five years, and can’t begin to imagine what the next five will bring. Therefore it’s with a great deal of gratitude I thank you for visiting and subscribing to The CAD Geek. What a coincidence that your anniverary happens to fall on my birthday! Now I’ve got something else to celebrate. Here’s five candles to you; you are to be commended and recognized for the productivity and support you have brought to the world of AutoCAD.